While in my eyes The 400 Blows is still his greatest achievement as his most truly “authored” work – more than any of his other masterpieces, the 1962 French New Wave classic Jules and Jim is perhaps the timeliest of all Francois Truffaut pictures, coming out as it did on the cusp of the sexual revolution that I can’t help but believe it played a part in inspiring. And honestly, when you view the film today, it’s as hard to place the ‘62 ode to sexual freedom and open relationships in the film’s 1912 period setting as it is difficult for the film’s eponymous leads to separate their feelings of love for the free-spirited Catherine from the sense of artistic goddess-like worship they have for the statue that she looks so much like. While in our case, it's merely intriguing, in the case of the heroes, the issue plagues them from start to finish in that they adore her more as a perfectly pure artistic object than they do a flawed yet fascinating woman. Based on the semi-autobiographical novel by Henri-Pierre Roche that Truffaut found while still a film critic at Cahiers du Cinema. although he fell in love with the prose right away it wasn’t until he saw the Hollywood western The Naked Dawn did he realize it would be possible to make a film from Roche's source material. Making notes in the margins the way he also did with the author’s Two English Girls in preparation for that film which he would make a decade later in ’72, Truffaut struck up a friendship with Roche to get his blessing on the adaptation before he ever shot a frame of film. And although the author passed away before Jules and Jim’s release, Truffaut championed Roche's legacy by translating some of his favorite passages (which have since gone on to become some of the film’s most iconic quotations) word-for-word. From the declaration that the future is always bright for a man who asks questions to some of Roche’s richly detailed narration and internal monologues, Truffaut’s decision to remain true to the material not only paid tribute to Roche but also helped bring the history of the characters and the inner-workings of their triangular romantic relationship to life with more authenticity. While initially the philosophically minded men believe they’re the ones setting the limits, the love triangle rises and falls in terms of who holds the power. And it becomes evident that Catherine is the more dominant one of the three since it’s undoubtedly she who calls the shots both in spite of and despite Jules and Jim’s alternating agreements and/or arguments to the contrary. As intoxicating, free-spirited and curious as its artistically minded main characters, Truffaut’s film is as much a celebration of life, love and art as it is an exploration of the genuine romance that exists between three fiercely independent, distinctly different yet similar, passionate souls. 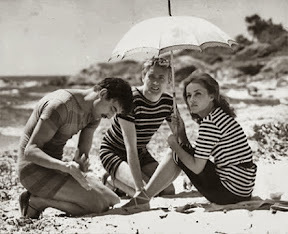 And like any love affair, we’re there for the ups and the downs as Truffaut’s trio of larger-than-life personalities embodied by Jeanne Moreau, Oskar Werner and Henri Serre (as Catherine, Jules and Jim respectively) seem to be both at their happiest and contradictorily at their most troubled together, particularly when their passions converge on the same point of the triangle. In other words, Jules and Jim was an early cinematic declaration of the romantic truism that would be solidified in song lyric two decades later by U2, since these three souls couldn’t live “with or without” the other (one or) two. 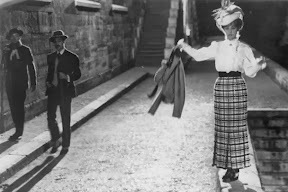 As fascinating to watch for its strong narrative (as one of the closest things we will get to a novel on film) as it is a vivacious representation of life being lived, one of the great mysteries of Jules and Jim is in its stark cinematic contrasts. 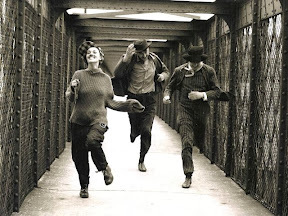 From one woman frantically smoking around a room to a man sketching on a table or a foot-chase across a bridge, at times Jules and Jim seems so spontaneous and so carefree that it’s as though Truffaut left the camera running in between takes. Whereas in other moments, given the usage of recorded pieces of narration over visuals of war or time passing, Truffaut employs a traditional adaptation technique that’s undeniably self-conscious about the newsreel footage, pictures and sources it’s using for inspiration. 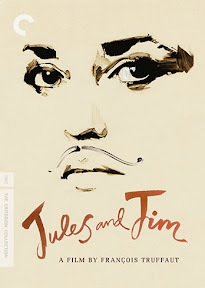 As such, Jules and Jim is a film that’s constantly surprising the viewer with its juxtaposition of “happy accidents” and polished, classical cinematic techniques to make something altogether new and exciting. Watching it for my third time (the first as a thirty-two year old woman since two viewings as a film obsessed teen on VHS), not only did I first have to get over the absolutely dazzling clarity of the Criterion Collection’s breathtaking Blu-ray which drove me to distraction but I realized that even though I remembered it so well, I felt as though I was watching a completely different film than I’d seen roughly sixteen years earlier. From Catherine’s defiant jump in the water when the men espouse their sexist philosophy to the way they’re understanding that their relationship (which felt like a dream right from the start) may not work out without acknowledging that another human being may need to grow and change with someone else, there’s so much being said in Jules that Truffaut is trusting you to process on your own. Moving at a brisk pace while introducing countless theories and sometimes arguing against them moments later, the film lets you make of it what you will, knowing that our sympathies will likely change from one moment to the next as much as they will the next time we view it from a different perspective, with the benefit of time and experience on our side. 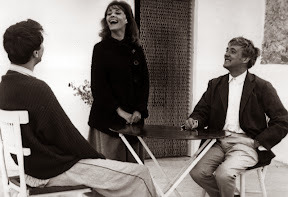 Thus, Jules and Jim is likewise as timeless as it was timely for its 1962 release, playing better with age by becoming a new film every time you see it. Matching Criterion’s absolutely awe-inspiring high definition transfer of the film that rivaled another modern black and white film I saw last week in the same format with first rate sound, Jules and Jim looks and sounds better than I’ve ever seen it before with Moreau’s gorgeous vocals coming through richly on every speaker and the sharpness of the photography at an all-time high. And in the same spirit of artistic celebration and Joie de Vivre exploration that the picture espouses, Criterion’s simply stunning Blu-ray/DVD dual format release is a must for Truffaut lovers, loading a plethora of film school worthy extras from vintage Truffaut interviews to scholarly analysis and a collectible booklet in the pre-Valentine’s Day release of the auteur’s classic love triangle in (what else?) this sensational 3-disc set.